A brightly colored crane for a dreary day. Three origami cranes, in celebration of Mardi Gras. The crane is considered to be the most iconic of all origami models. 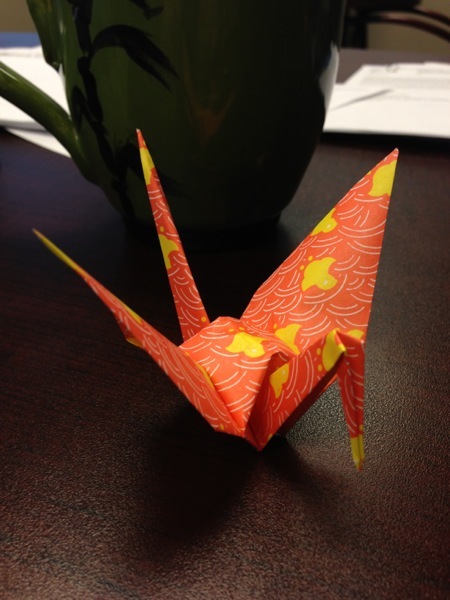 It's easy to learn and easy enough to fold - and the crane is considered to be a symbol of good luck and longevity. Consequently, a Japanese tradition states that someone who folds one thousand cranes will be granted either good luck or a wish. Traditionally, the cranes are threaded together once they're folded, and then given as gifts or hung in one's own home. It has been a while since I've done origami, and I miss it. I find the process of folding cranes to be meditative and rejuvenating - and I've been in need of a little meditation and rejuvenation in my life lately. Therefore, I've decided to embark on the journey of one thousand cranes, and to record them all on tumblr. I intend to fold at least one per day, which means that this should take a little under three years to complete. You are welcome to join me on my journey. You'll see lots of cranes and a few other origami models as well. Photographs I’ve taken of things that make me happy, part 4: origami. 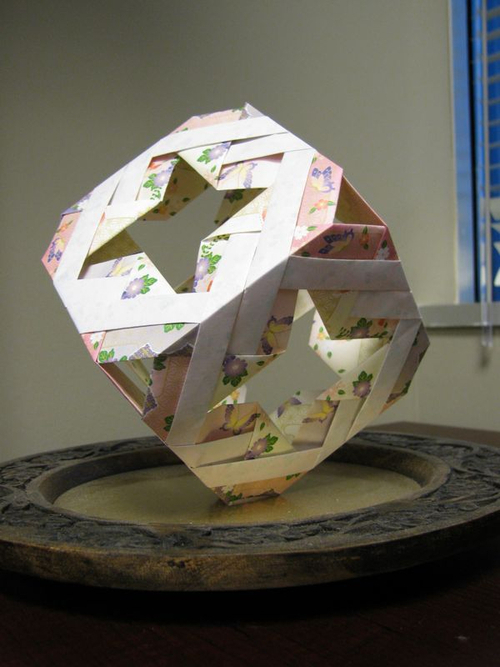 This modular piece was folded from 12 squares of uncut origami paper, and assembled without glue or other fasteners. The 12 units lock together to form a stable cube, which is now sitting in my office. 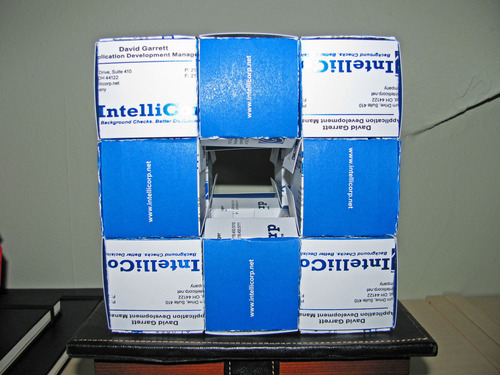 The above is a Level 1 Menger Sponge constructed from 20 structural units made from 6 business cards each, plus exterior paneling, for a total of 168 cards. The unit was assembled, as always, without any glue or other fasteners. 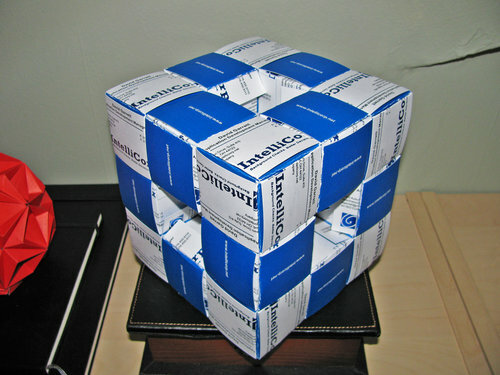 A menger sponge is a fractal cube created by dividing each face into nine squares and then removing the center square. The complexity of the sponge increases as you repeat the process with each of the remaining squares on the face, and then the squares left from that process and so on. 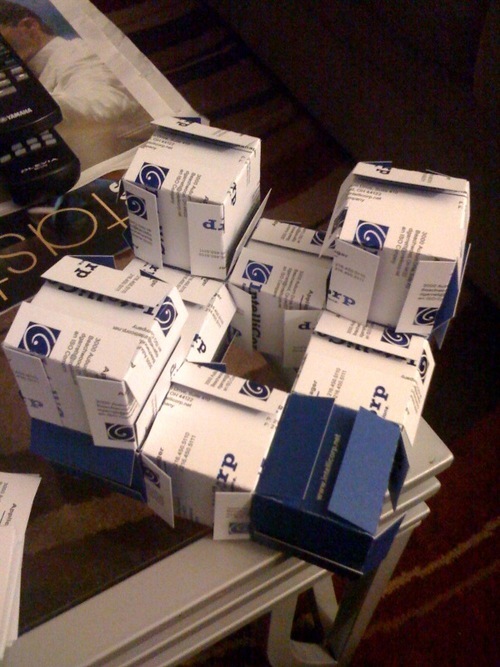 Other people have constructed Level 2 and even Level 3 sponges, but it requires a whole lot of business cards. 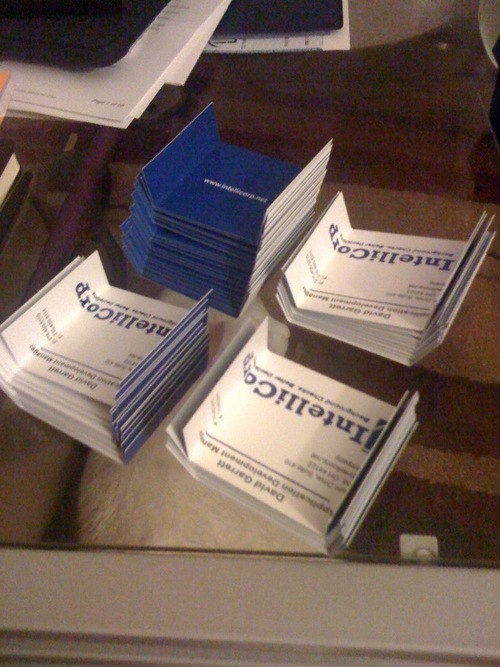 Above, folding the business card units. 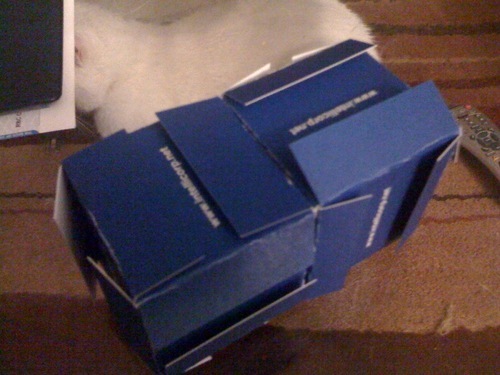 The first two structural units, constructed from 6 cards each. The sponge after adding more structural units. Once the structural units are in place, it is customary to panel all surfaces with additional cards. Unfortunately, this time I ran out of cards and had to leave the interior of the sponge un-paneled.